one of our first customer projects for our good ol' friend siggi! 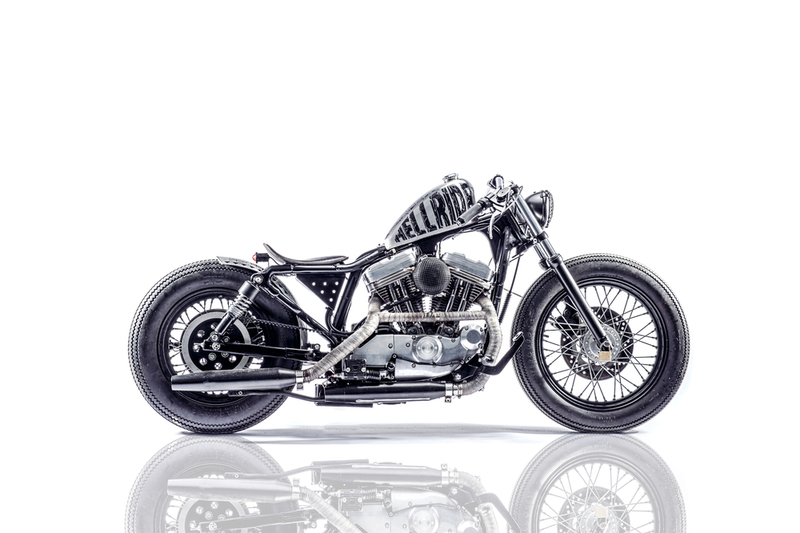 it was clear for him to build a wonderful bobber out of the 883 Harley sporty! 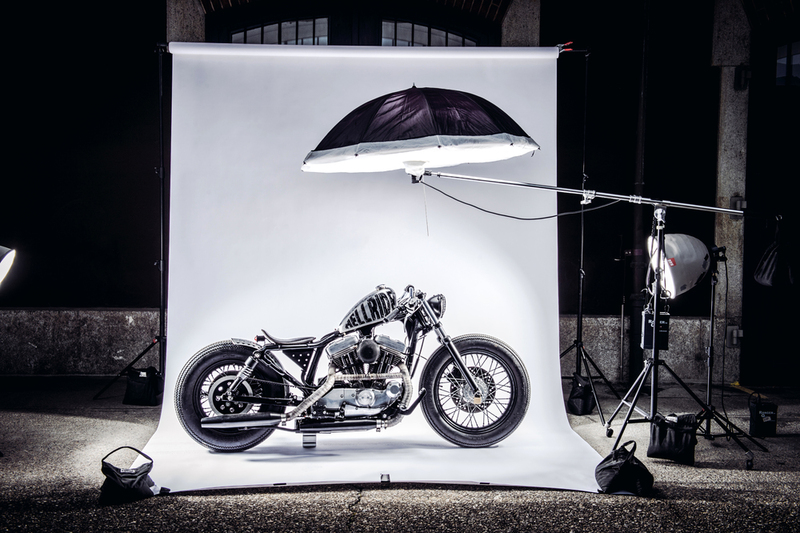 due its vintage treatment, the whole bike got stripped down to the bare frame and the design began. The blacked out frame was cleaned up and the fender struts completely removed and detabbed for that old school, zero clutter look. Next up in making it a rolling chassis was to give the wheels a tougher look, the hubs have been left in raw metal while the rims and then the spokes were painstakingly painted in black. The paint on the outer rims was not just any black but one that would match the predetermined tires and give them a fatter look, they are of course classic Firestones. The suspension was then dumped to the deck, the front forks have been taken down as much as possible before they would bottom out and the stubby rear shocks flatten out the bike bringing the rear tire up close and personal with the seat. 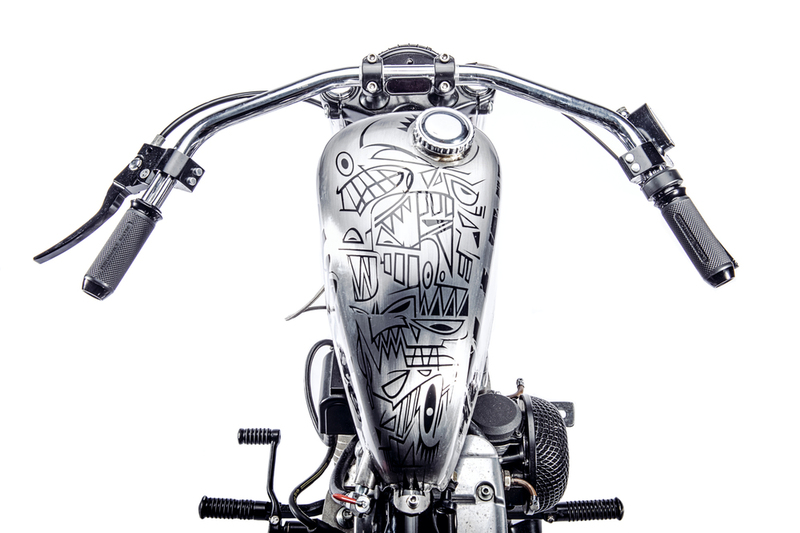 The peanut style tank is the perfect look for any bobber and custom mounts were fabricated to ensure it runs true to the lines of the backbone. The standard seat is gone, so too are all the mountings and catches that would normally keep it bolted down. 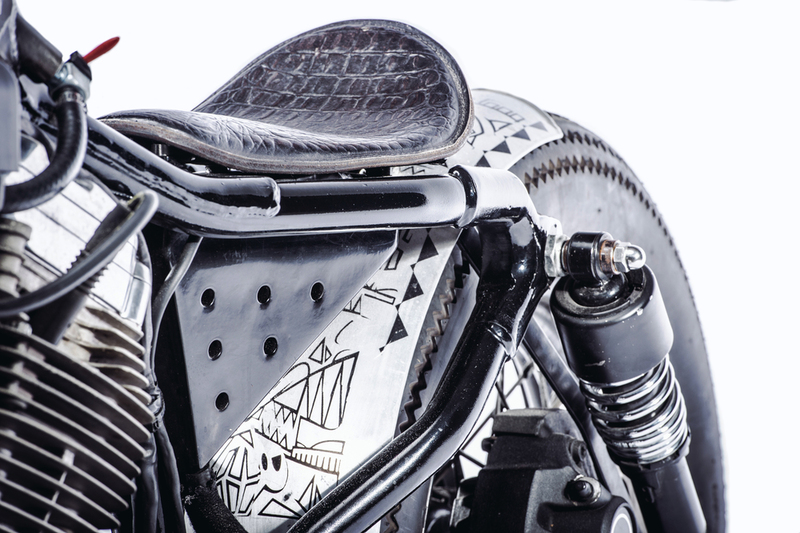 In its place is a custom leather bobber seat that not only looks the business but is shaped to flow effortlessly with the lines of the new tank. Finishing out the less is more approach is a new one off rear fender that has been cleverly mounted on the swingarm where the chain guard once was. This gives the look of a tire/fender gap that is incredibly close without running the risk of the two ever meeting with disastrous consequences for the rider. 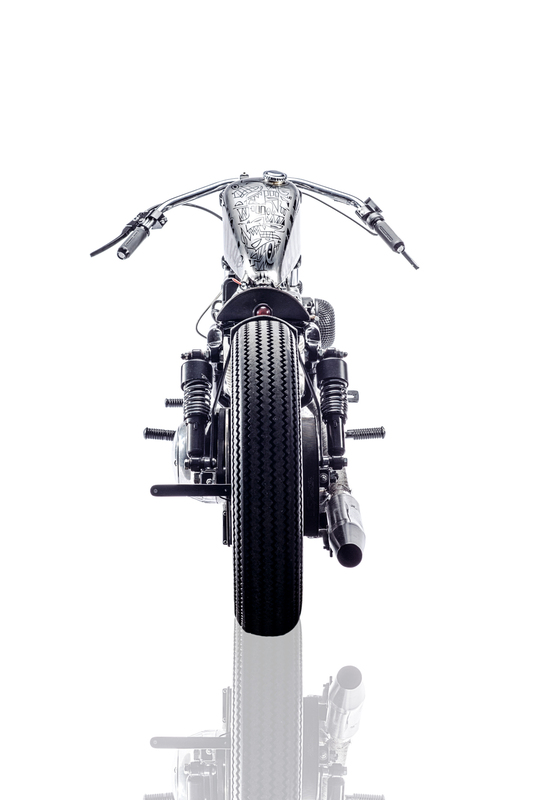 A minimalist look is not too much of a challenge until you get to the vitals of any motorcycle that actually make it run. Solving some of that problem is the mounting of the battery and other electronic components in a small box under the gearbox. 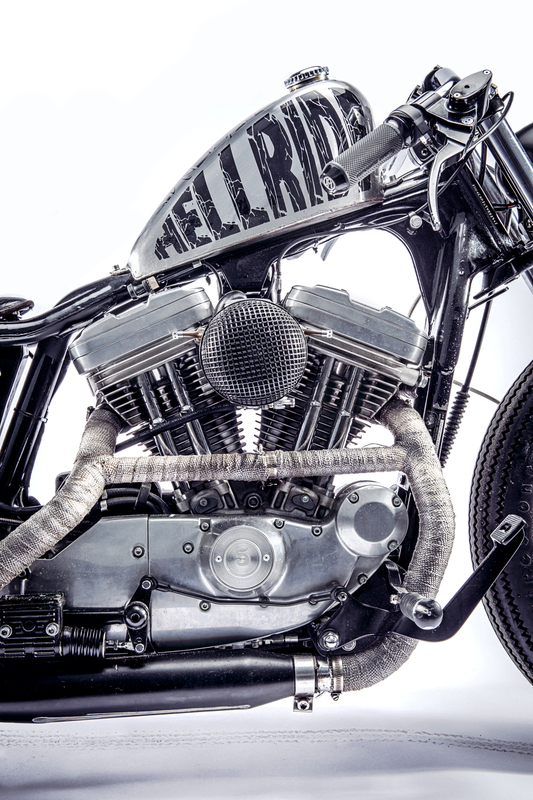 The result is beautiful negative space that allows you to look through the frame and see the classic Harley V-Twin without anything obscuring the view. Sadly the standard oil tank is a bulky item for such a small frame and would have completely killed the mood. So the Young Guns set about hand crafting one that was not only smaller but was more in line with the theme of the build. Worried the reduced capacity might negatively affect the oil temperature, cooling pipes were cleverly integrated into the tank and back to back testing with the original now shows an even lower oil temp. the painting was done from our good friend and artist aramis navarro. due it's appearance it got his name "fürchtegott"! that was the first thing, siggi said, after he saw his bike for the first time. a creature which everyone should be scared of!